A vodka-stained shirt, a fight, saving a life, sweat, and bruises summed up a night at A$AP Ferg’s Turnt & Burnt tour stop in Montreal. A very youthful crowd packed Metropolis when doors opened at 8pm, and it seemed as though people weren’t just there for a concert; instead, it was an opportunity to post up with their squads to let others know they were in the building. The crowd flaunted its latest fashions, leaning against walls with one foot up intending to stunt on the kids who think they’re cooler. In a way, the environment was tense, but you knew that underlying this subtle competition was the excitement of seeing A$AP Ferg & Co.
45 minutes after the doors opened, up & coming A$AP Mob member Marty Baller took the stage, performing songs from his newest mixtape, Marty G Raw. His eccentric, animated energy coupled with bass-heavy, high bpm songs enthralled the crowd into a frenzy of shoving, jumping, and pure aggression. That standoffish tone that had been so present pre-show had completely vanished. Everyone was in a sort of unison, moving together as one large pulsing mass. Marty Baller delivered as one would expect an emerging artist to: he performed as if he had everything to prove. After his set, one nearly forgot the show had only just begun. After a short intermission, Rob Stone took stage to face a sweaty, revved up crowd demanding more. His set only added fuel to the fire and the energy was intensified. When it seemed as though his set was over, the stage lights faded out until the venue stood pitch black and an excited confusion filled the air. After a short period of silence, the chilling whistle of Stone’s most popular anthem, Chill Bill, pierced the atmosphere and the crowd erupted. The crowd split into two walls, and at the moment the first bass dropped each side collided with the intensity of two sides at war. Bodies were flying, feet were in the air, and arms flailed. It was survival of the fittest in this pit of ear-splitting, vibrating bass and hostility. Following Rob Banks’s set and another quick intermission, I awkwardly thrusted my way towards the front of the stage in anticipation of the final opener, Playboi Carti. At this point, we all desired more sweat and bruises and Carti gave us just that. Decked out with sunglasses and a winter coat, his image reflected the peculiar, youthful style that was so readily displayed by the crowd before the show. Carti’s energy, coupled with performances of his most popular songs, “Fetti,” “Beef,” “Talk,” “Run It,” and “Broke Boi,” reminded us the show had only just begun and that we needed to go just a little bit harder. Moshing persisted for the entire set and the crowd moved as one in every direction squeezing everyone within. Many people lost their balance and fell, forcing myself and others to help them from being trampled; it was a telling reminder that we were all in this together. After Playboi Carti’s exit the final intermission commenced, during which many individuals hastily made their ways out of the crowd for some much-needed hydration. There was a small fight and a drink was inadvertently spilled on me, but it was all part of the experience — not to mention fitting preparation for the show’s conclusion. A$AP Ferg finally took stage at around 11:00 after what had already felt like an entire music festival. The entire venue was illuminated in purple and pink lights from the stage that created a very hazy, mysterious atmosphere. 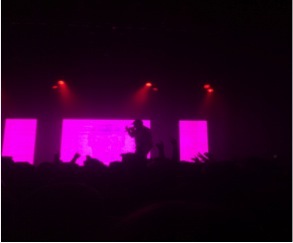 He opened with “Rebirth” from his most recent album, Always Strive and Prosper. 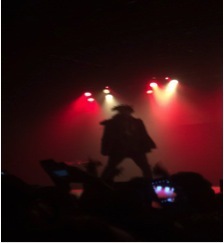 He then performed “Hood Pope” from his 2013 album, Trap Lord, singing acapella at one point. Marty Baller also made another cameo when performing “Telephone Calls” alongside Ferg. A$AP Ferg concluded the show declaring it was finally time to get “burnt.” This worried me. I thought I was beyond burnt at this point. More like pan fried and slightly overcooked then thrown to roast in an oven. And in an instant the high tempo, heavy bass tracks of “New Level,” “Work,” and “Shabba” played back to back, squeezing all of the remaining life from the crowd. Upon the conclusion of his set and the crowd’s applause, I felt a sense of relief walking out of Metropolis. I was dead; bruised everywhere. The sweat that drenched my face was now salt making the commute home in the cold rain more bearable. It was quite nice actually. The undying, almost relentless energy of the show made the experience truly rewarding and enjoyable. Overall, A$AP Ferg’s Montreal stop on his Turnt and Burnt tour was nothing short of “Turnt & Burnt”. This entry was posted in Reviews and tagged A$AP Ferg, hip hop, Metropolis, Nathaniel Bahadursingh on January 9, 2017 by CKUT Music Coordinator.